*Regular nightly rate is $510. Weekly rate is stay for 7, pay for 6. Your reservation total will include a cleaning fee and bed tax in addition to the rental rate. In the Zone! Beautifully Remodeled Riverfront Home, *Seasonal (July-Aug) Dock & Boats, Outdoor Dining/Lounging Deck with Hot Tub, Ping Pong, Grassy Yard. Central Heat, Woodstove, Foosball. Easy Walk Downtown (half mile, no sidewalks), Pee Wee Golf, Playground, Tennis. Short Drive to Wine Tasting, Coast, Redwoods, Golf. Wi-Fi, Landline Phone, Cable TV. Keyless Entry. Your Well-Behaved Dog is Oh So Welcome! Riverlands’ entry is up a set of stairs. 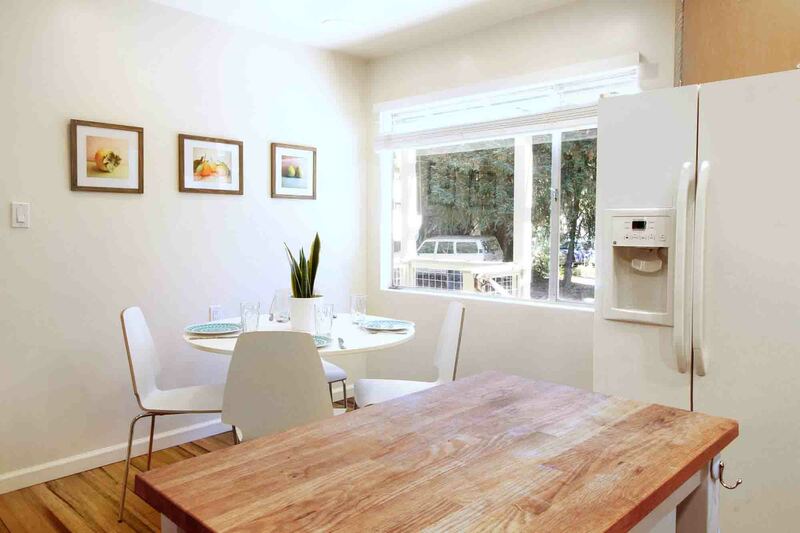 The kitchen, semi-formal dining, and living room open to each other and wrap around the central woodstove console. 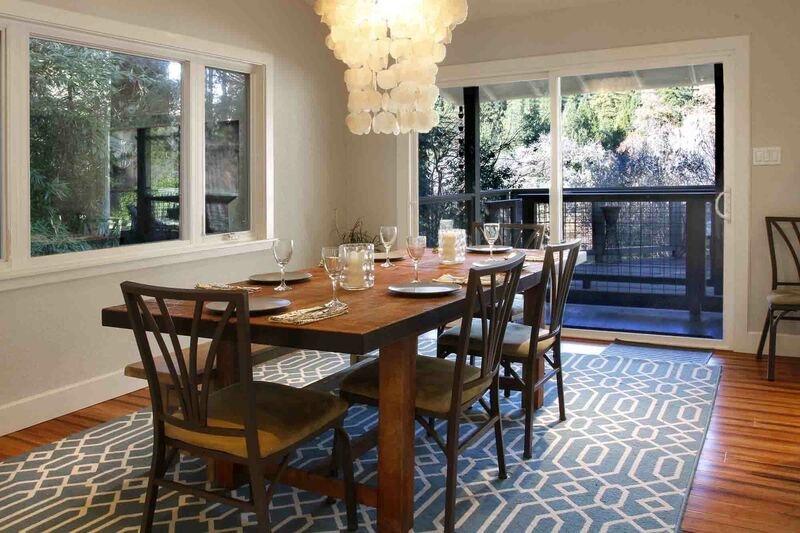 The living and dining rooms open to a large deck with outdoor dining, loungers, hot tub. 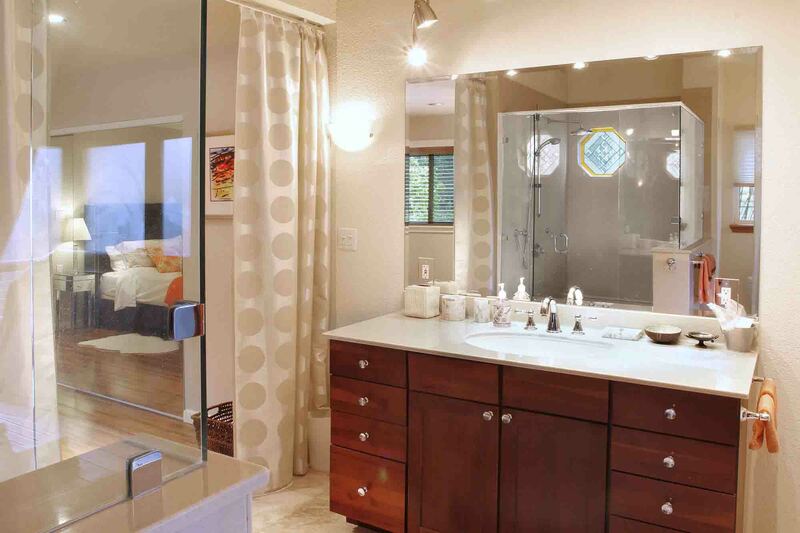 Down a hall, there's a full bath, bedroom and master suite with its own full bath. 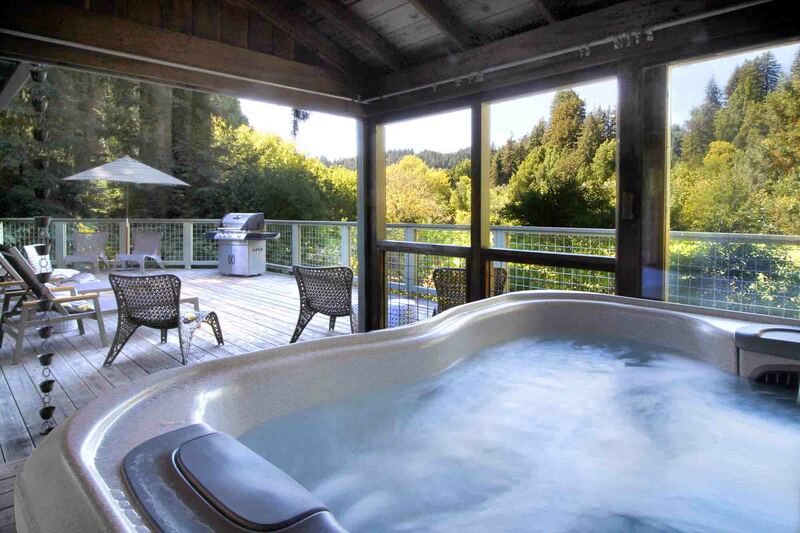 Beyond the master suite, the hot tub sits in its own room that also opens directly to the deck. 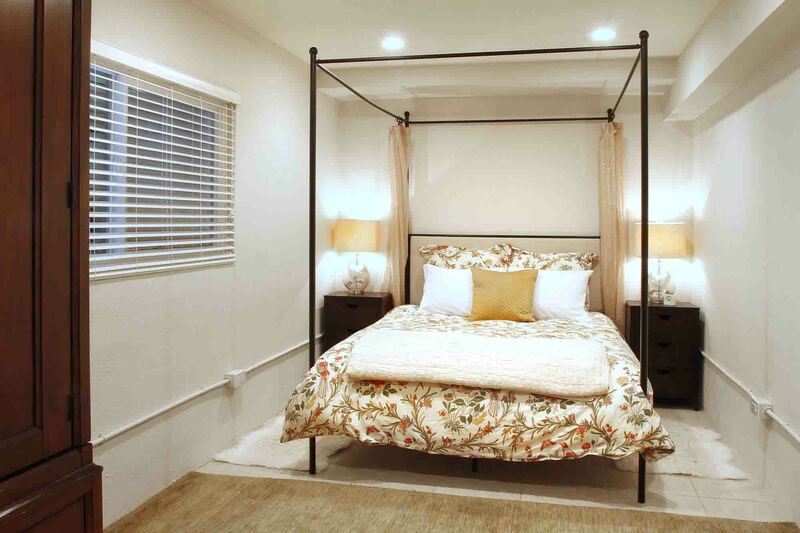 Note that there are curtains only (NO doors) between the master bedroom and master bath. From the deck, there are exterior (NO interior) stairs down to the two bedroom suite with full bath, surrounding a central game room with full size foosball table. A few more stairs lead down to the rear yard and *seasonal dock (July-Aug). 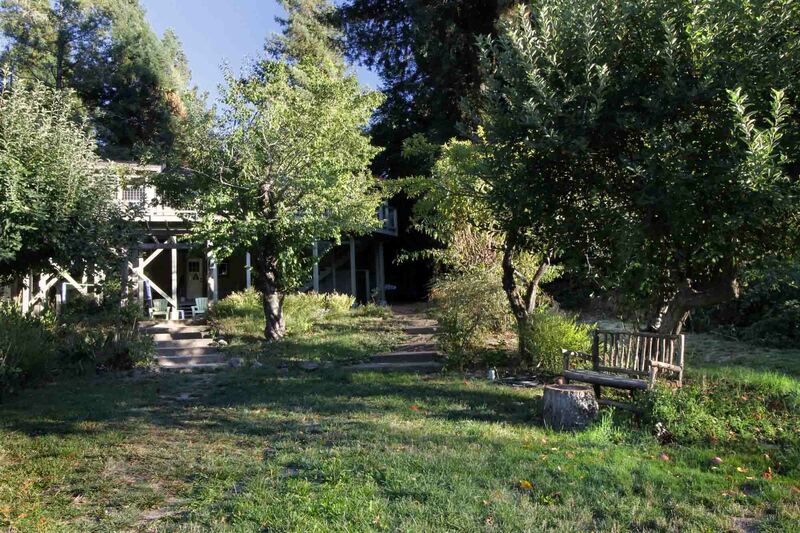 Upper level 1700sf; lower level 1000sf; grounds are 1/2 acre. 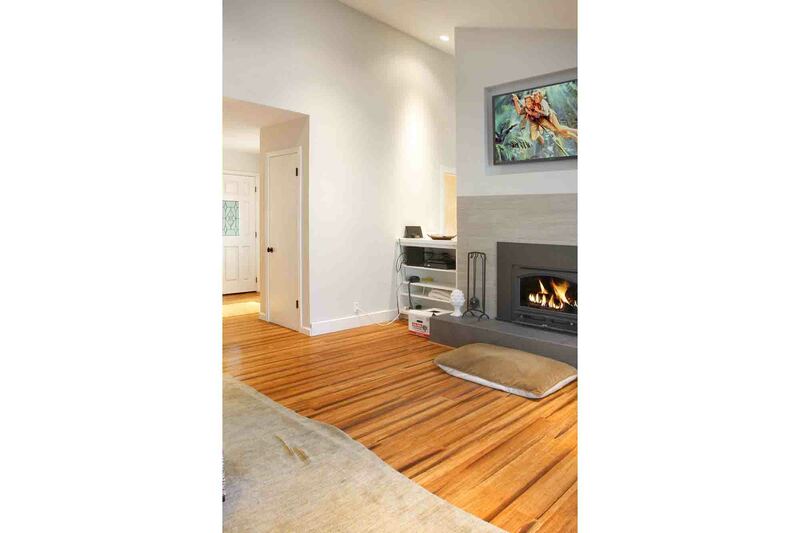 Central Heat (upper level), Woodstove (living room), Wall Heat (lower level). Ceiling Fans (living room, upper bedrooms). NO A/C. This was a great place for our family to vacation together with plenty of space for everyone. It was clean and comfortable with great views off the deck to just relax. We also used the foosball & pingpong a lot! 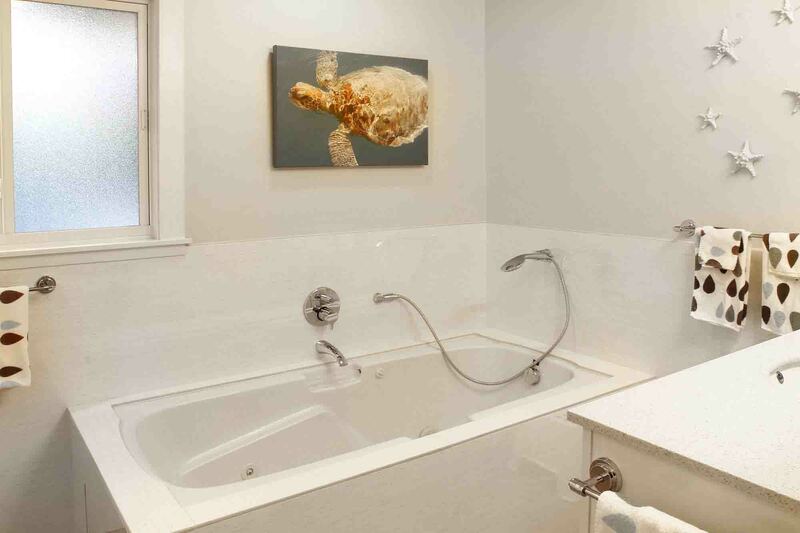 The hot tub was also a treat as well as the beautiful master bathroom with a rain shower. "The house was great! " The house was great! Exactly as described. Beds were comfortable, the porch was great, and we loved having use of the boats at the dock. Would definitely stay again. Perfect spot for relaxation, wine tastings and walks to downtown. It was a great spot. 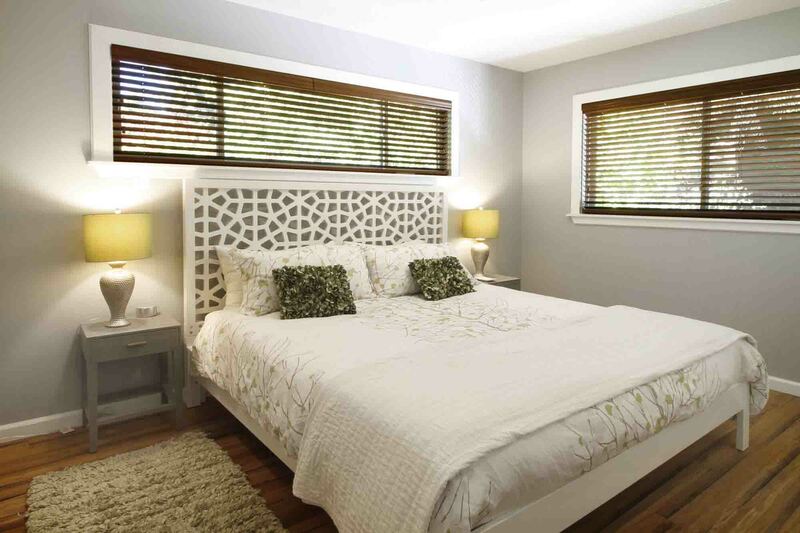 "Our stay at Riverlands was simply perfect"
Our stay at Riverlands was simply perfect. The photos don't do this house justice -- it's even more beautiful and spacious in person! I rented this house for a birthday weekend with friends, and it had everything we needed for a super fun, relaxing weekend. It was easy to use the kayaks, the BBQ was perfect for our family style meals, and the hot tub was THE BEST. The kitchen was also really well stocked with everything you'd need to prep and serve group meals. My favorite part of the house was the big, oversized porch -- my favorite part of the weekend was just relaxing and lounging in the sun on the porch, soaking up the beautiful lush green surroundings and the river below. And all of the bedrooms were super cozy comfortable. I'd highly recommend this house, and hope to come back again soon!! This house is amazing! We were a group of 7 adults and one toddler and were impressed with the well stocked kitchen tools for cooking and dining, comfortable living room, beautiful deck and view, and even toys for the toddler! Plus it’s 2 minutes from downtown and short drive to great wineries. The hot tub, backyard, fully stocked kitchen, comfortable beds, well-picked decor, and walking distance to town made our weekend so enjoyable. Also being right next to the river in the middle of the redwoods was so beautiful. Though we didn't have any kids or dogs, it looks like it would be a good place to bring them as there's a ton of toys and dog gear available in the house. "This place is perfect for families"
This place is perfect for families. We had two families and a couple use the space and the River Gateway had everything we needed to entertain the children. There are tons of low tech children toys and books. There is a very nice park about a block away. The deck was also perfect for children because it is fully enclosed with limited access to stairs. Although I didn't bring my dogs this place is a good option for pet owners because of the enclosed nature of the deck and front porch. I will be renting this unit in the future if our travels bring us back to Guernsville. We were a group of 8 adults and this place was the perfect size, lots of space, a very well stocked kitchen, and all of the bedrooms were sizeable. The place was in a great location that was walkable to town. We really enjoyed having the hot tub! And the house was very clean. Would definitely stay there again and highly recommend. Great place! It's at a beautiful spot on the river - easy to walk into town but still feels remote. The whole place was really nicely laid out for a weekend getaway - plenty of space, bathrooms were WONDERFUL and the hot tub is of course a killer feature. Amazing location. 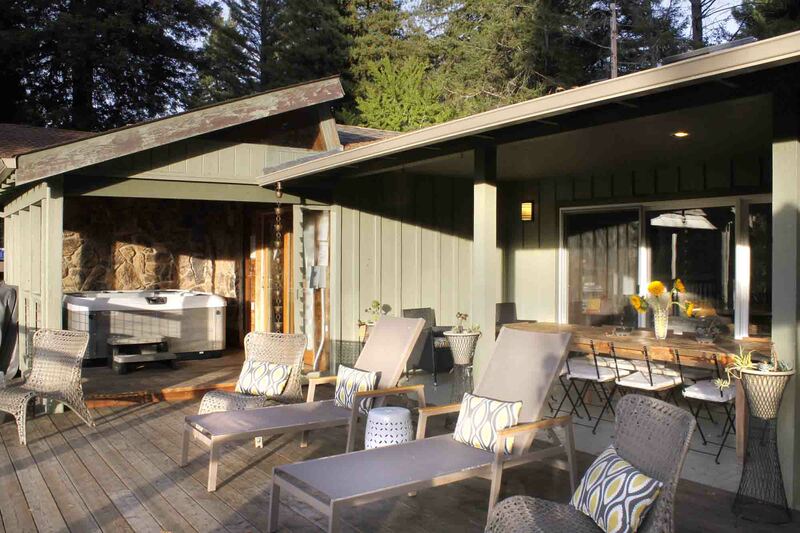 Walking distance to town, dock on the Russian River and a Hot Tub! The host had amazing communication skills with very detailed instructions. Very easy keyless check-in. Beautiful house with a great deck, sunset views and spa-like amenities (hot tub, larger master bedroom walk-in shower with a rain shower head). Recommended! Would stay again in a heartbeat. We were a group of 7 adults celebrating a special birthday. The house exceeded our expectations. We made virtually all of our own meals, and everything we needed in the way of implements was furnished in the kitchen. This felt much more like staying at a house owned by friends than in a vacation rental. The upstairs main house is modern and stylish, and the extra bedrooms downstairs are quite serviceable. 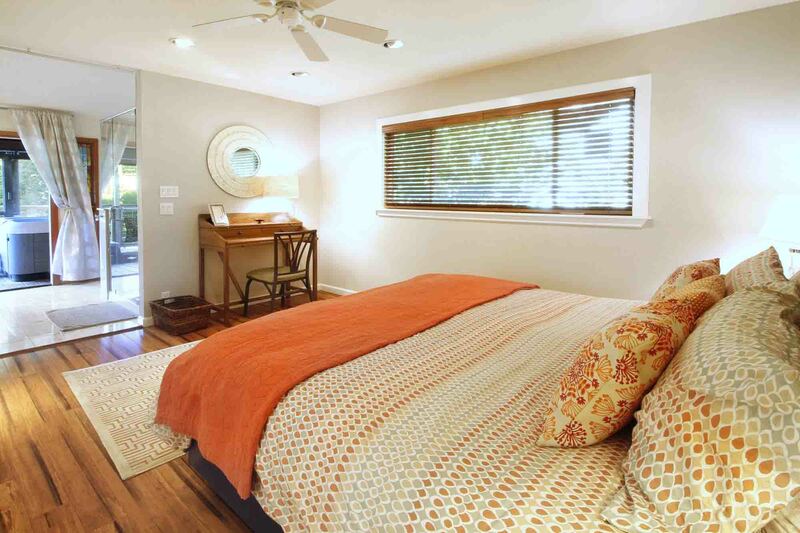 Beds are comfortable, and the master bedroom is especially nice. 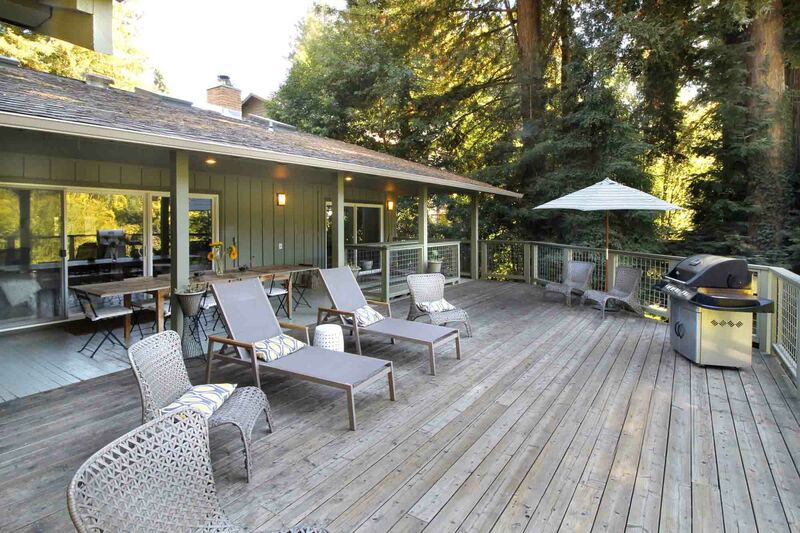 It would be impossible to find a better location in Guerneville, and we spent a lot of time on the large deck overlooking the river. Would definitely stay here again. "Beautiful home with a killer view and hot tub!" "Great location, spacious backyard with fruit trees! " 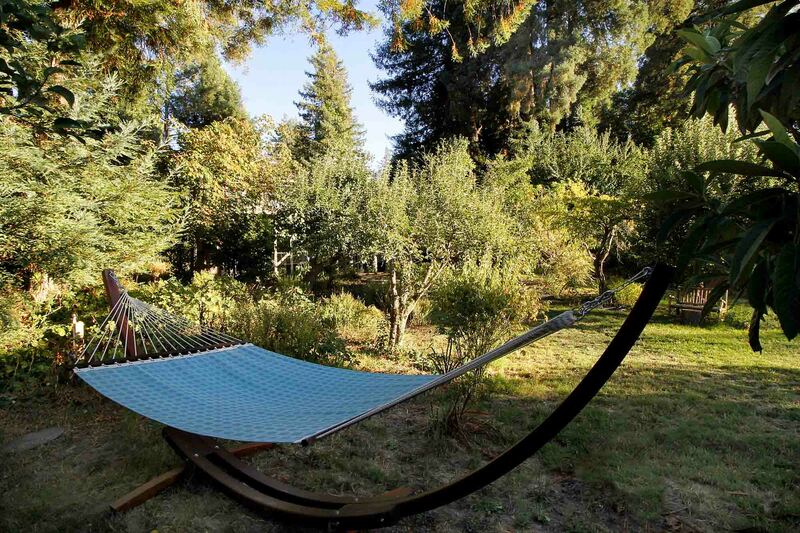 Great location, spacious backyard with fruit trees! We loved the upped deck and enclosed hot tub. We did wish however the downstairs was accessible through the house and there wasn’t so much dog hair. If you have allergies beware. Overall beautiful home with many amenities. Great spot on the River, close to downtown, and great for a multi-generational family. "We had such a great time..."
We had such a great time, can’t wait to come back in the summer! We rented this house for my birthday and it offered so much more than we expected! The kitchen was equipped with everything we needed, bedrooms were spacious and house was cute and stylish. 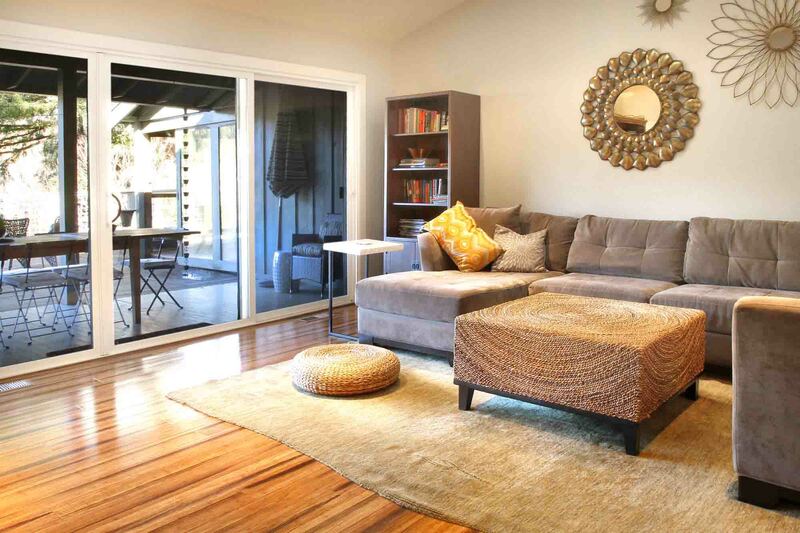 This house is a perfect place for a group of friends to sit around and socialize. 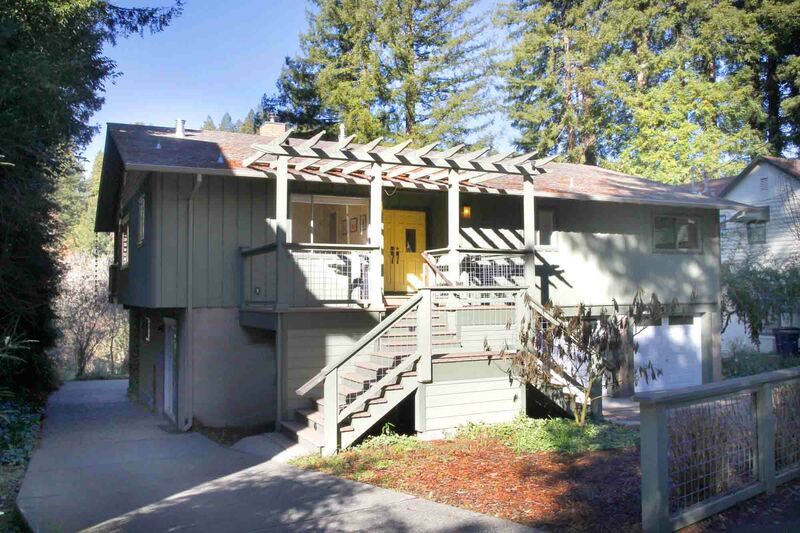 Also walking distance to downtown Guerneville. We didn't get to utilize the deck that was adjacent to the river because it was cold but this place would be an optimal place for the summer as well. We loved this house so much we are considering renting this place again! "Great house in a great location..."
This was a great house in a great location. We loved the backyard, patio and the quick walk into town over the scenic bridge. The separate entrances were a plus for us, as it offered privacy to guests that wanted it. The living room, dining room and deck was spacious enough to hold our group for nights when we wanted to hang out and play games and make dinner. I would recommend this place to others. Thanks for the great vacation. "This was the perfect venue for a family gathering"
This was the perfect venue for a family gathering. Very close to town, but also very quiet at night. Close to the footbridge to walk, which allowed us to leave the car at home. We also realized it was perfectly set up to accommodate kids from any age. Loads of toys and games and books for all ages, not to mention the perfect grounds for exploring and getting out on the water. Parks nearby and the town itself lends itself to catering to all ages. Really a perfect wine country experience. Great location. We had such a fun team offsite. The house is perfect for a large group and all details were exactly as described. "Riverlands was a great 2 week holiday with our family..."
"Hunter at Russian River Getaways was awesome..."
Hunter at Russian River Getaways was awesome and super helpful! 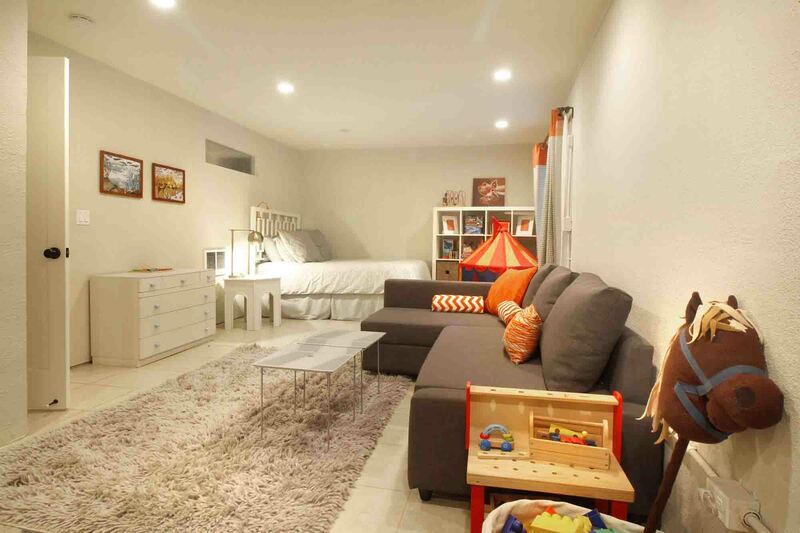 Great house, fun game room for kids and dog friendly! Would definitely visit again! "Charming, ideal spot to visit the Russian River valley wineries"
Five of us stayed for a weekend visit for the purpose of wine tasting. Unfortunately, it rained the entire weekend (Jan 6-8), but otherwise, we had a great time in Guerneville, which we used as a base of operations for our winery visits. A major plus was access to a major supermarket and also the restaurants and bars on the main strip of Guerneville - which was only a 2-3 minute drive from the house. Two bedrooms are in the main upstairs level (large bed in each could easily accommodate two persons each , and there are 4 more beds in the downstairs level (including bunk beds), which is accessible only by going through the back outdoor patio (but access is covered). The kitchen was very well equipped all around and my only wish was that the stove had gas flame burners instead of the electric rings (but they did the job). We did experience a fuse shorting (apparently, we used too many kitchen appliances at the same time), but we were able to easily remedy the problem (fuse box in an upstairs bedroom). Overall, I would highly recommend - but we probably would have gotten better use when the weather was warmer/calmer/better to be able to take advantage of having access to the river, eating outside on the patio. We found the house to be well maintained, and clean, and the property managers were very easy to work with. 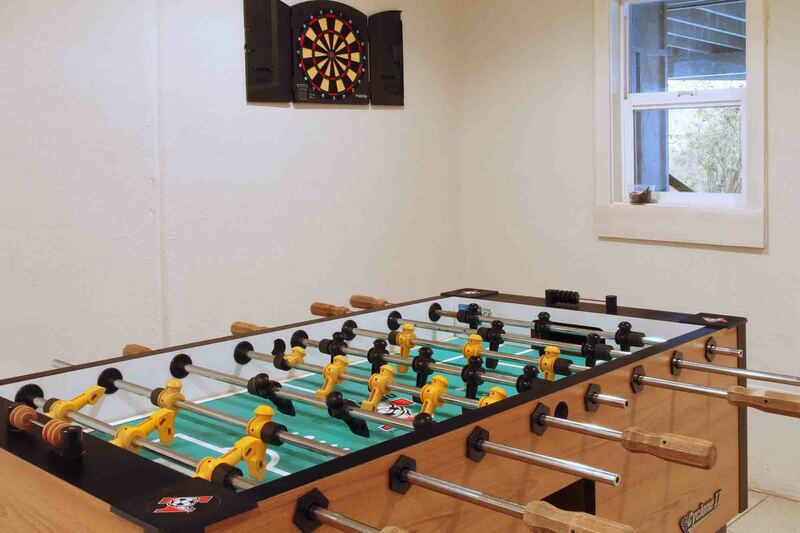 Also, I forgot the mention: the downstairs foosball table and dartboard are great! "The place overall is amazing..."
"Spacious, Full Equipped, Perfect Location"
We had an excellent time at Riverlands! Having 2 toddlers with us it was a welcome surprise to find so many toys, kids plates, high chair - everything we needed. Bedrooms were comfortable and overall design was sharp. we loved the deck, the hot tub and proximity to the river. We all talked about rebooking the house for the summer season! "House nicely accommodated all of us..."
This house nicely accommodated all of us, including our dog. Fantastic deck! They even had dog beds and dishes. The kitchen was impressively well-appointed for cooking. 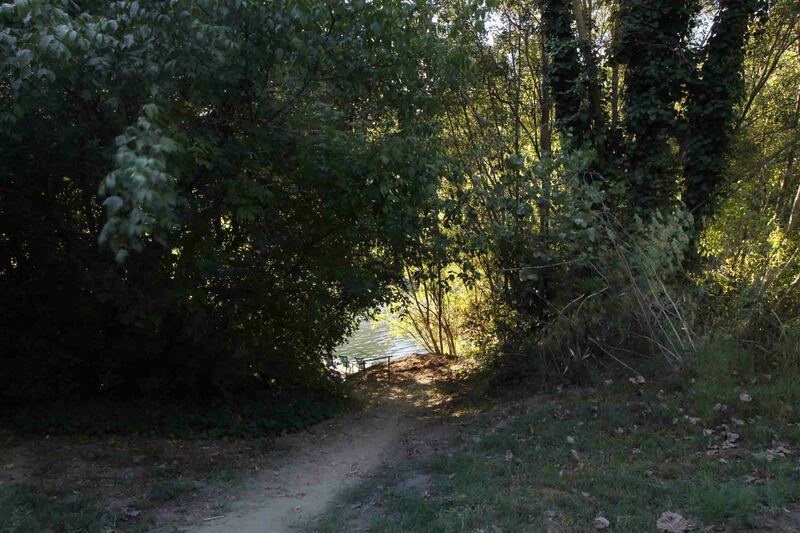 GREAT location - right on the river but close enough to walk to town. Vastly entertaining to sit on the dock and watch people do the rope swing across the way. This home was very comfortable, not stuffy, nice dock on the rivers edge, very well stocked kitchen and super kid friendly. Would definitely stay at this property again. Gurnville is a once a year get together for my family. This is a perfect house the way it is setup with the downstairs bedrooms and game room. Having the hot tub on the top deck was really nice in the evening. You can sit and have a glass of wine and watch the sunset. We did not spend much time in the house because it has such a large deck, everyone ended up out there at night talking. It also has a long table so all of our meals were eaten outside. There is plenty of parking and your with in walking distence to town. Who ever designed the showers did a fantastic job. I loved the shower built for 2. It also has a outdoor shower so you can clean off after being in the river. The one down fall of this house is the view. The trees need to be topped so that you can see the river. The river is right there but you cannot see it. "Great location and a beautiful home,"
This house has everything you need for your vacation. We were in walking distance to town, no need to drive to Safeway, restaurants or just to walk arownd town, if you are bringing children they have thought of everything. From the high chair, the toys, the Foosball table to the bedroom that is decorated for children. They also have plenty of life jackets and water toys for the river. The house is beautifully furnished. The bathroom are something else from the shower for 2 with the rainfall shower head, to the bathtub with the jets. Outside of the master bedroom /bathroom is a hot tub that fits 4 very comfortably. You sit out side with amazing views of the trees. The deck is very large. We spent a lot of time on the deck. It is set up with a long table that is perfect for family meals. If you just want some quiet time the deck is perfect to relax and unwind. There is also a large dinning room inside but we never used it because of how nice it was outside. 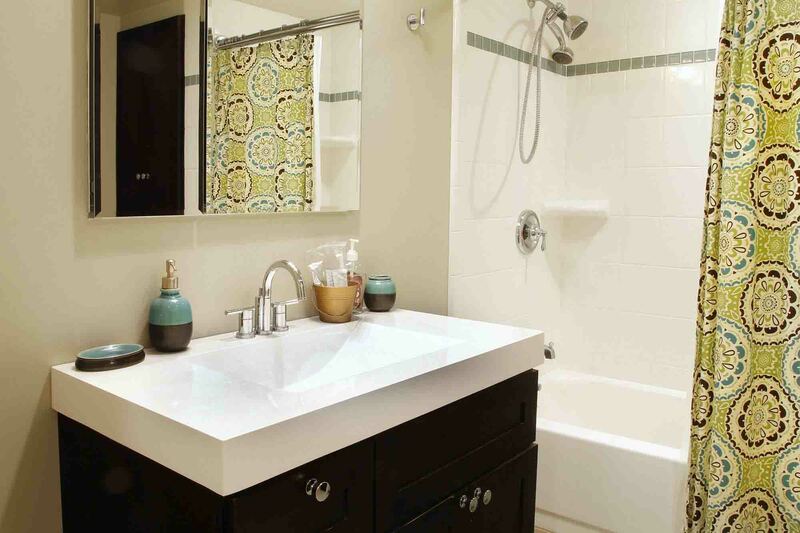 It has a full size washer and dryer along with a outdoor shower that is very convenient. This house has plenty of parking. We took 3 cars but there was room for 1 or 2 more cars easily. We had problems with the DVD player but one call to the management office and they came out with a new one. Very nice dock with chairs. It has a wooden dock that is very sturdy. Your not bouncing around or have the feeling your going to fall off. The only thing that needs changed is if that the trees would be trimmed so that you will have a river view. You can't see the river from any point in the house and the river is right there. We would recommend this house especially for people with children. "The house on Riverlands was fabulous!" The house on Riverlands was fabulous! It was just what we were looking for in terms of convenience, comfort, and extreme relaxation. The check-in really couldn't have been easier. The house was very clean and the upstairs was really cozy. The downstairs wasn't bad either, just not as cozy as the upstairs. The deck and the hot tub area was a perfect place to relax and dine. One of the MOST impressive things about this house was that the kitchen was FULLY STOCKED. We usually bring our own knives because those dull knives that are normally at rental houses are a real pain in the neck. Not in this house! It might not be the most beautiful kitchen I've ever seen but who cares! They had everything! Thanks for a lovely stay! "Listing description was very accurate..."
Listing description was very accurate and house was great. Top floor and deck are very nice and updated with bottom floor more of an in law type unit or for kids. House had direct private access to river which was great. The upstairs in this place is awesome! Two king beds, a well stocked kitchen, awesome bathrooms. The downstairs is disconnected from the upstairs and a lot more modest. It's really more for teenagers and not great for adults or adults with small children as it's cold, only has a sink (no kitchen), super basic bath, and is pretty damp. We all opted to stay upstairs and had kids sleep on the couch instead of downstairs. Location is superb. It's about 8 minutes to town on foot, and the walk is very pretty. There is a playground a few blocks away, and the river is accessible everywhere. Overall price was pretty steep given that half the house was basically unusable for us, but it was overall a fabulous experience. Would recommend.